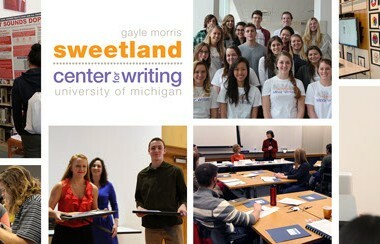 The Graduate Writing Groups, a Sweetland program underwritten by the Rackham Graduate School, were initiated in their current form in the 2011-2012 academic year. These groups provide support for graduate students writing their Doctoral dissertations and Master’s theses. Graduate students apply each semester to be group leaders or participants, and leaders receive training and mentorship from Sweetland faculty along with a small stipend. Internal data show that participation in the graduate writing groups leads to faster degree completion. Students, in their evaluations for the groups, confirm that the experience enhances their writing confidence and productivity. Furthermore, students say that the groups provide support, helping them to establish peer relationships that continue well beyond the time of the coordinated groups. The benefits for the students participating in the groups, however, are not limited to productivity and support. Participation in the groups stresses the collaborative aspect of writing and the importance of the revision process. Students’ constant engagement in peer review allows for an increased awareness of writing for an academic audience. One participant’s evaluation, for example, attests that group members “have discussed and agreed that a benefit of this writing group model is the luxury of having someone smart read a draft and help the writer fine-tune in a way our committee members, due to time constraints, cannot.” Participation also enhances self-reflection, preparing graduate students to become active contributors in their academic field. 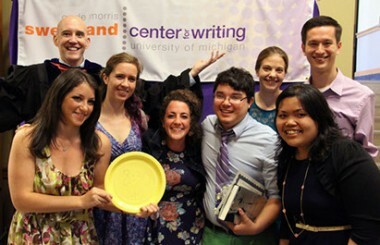 Applications for the Graduate Writing Groups are increasing, reaching a record number of 57 in the Fall semester 2013. Students come from a very diverse pool of departments and programs. The disciplines most represented in the application pool were psychology, natural resources, political science, and anthropology, as well as several language departments. We have also seen an increase in applications from the sciences and other more quantitative fields, such as physics and economics, which were slightly underrepresented in the past.